And most likely, you’re not a backup expert. Why wouldn’t you want your critical data protected by an expert? 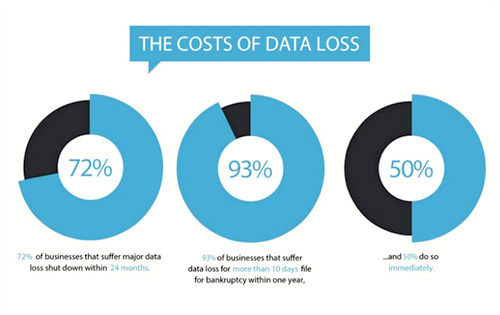 Did you know that 43% of SMB data loss is due to human error…human error that could be avoided with the help of a trained professional. You need the rely on the expertise of a backup expert who can properly install and configure your backup jobs based on your exact business needs. The good news is, NovaStor does just that – as a no-cost professional service for new customers! What is the Difference Between Setup Assistance and Demo Installations? Setup Assistance is a one-time professional service offered to server-level product customers to give them the benefit of our backup expertise for everything from installation and setup, to backup configurations designed to fit their specific environment. Setup Assistance is included with the purchase of NovaBACKUP server-level products, and is available for up to 30-days from initial purchase. Demo Installations are offered to first-time users to help them install and use a trial version of NovaBACKUP. NovaStor technicians do a live demonstration of the software to help users feel confortable and confident using our software. We believe that once people see NovaBACKUP in action in their own environment, and experience the level of service we offer, they will know this is the right solution for them. You don’t have to be a backup expert with NovaStor on your side. Why are Guided Installs Recommended for Server Trials? NovaStor offers demo installations for server trials. Why are these guided installs recommended: Customer Satisfaction. Watch our video to learn more. What Should I Expect as a Customer or Trial User? Any server product purchased through our online store includes setup assistance. STEP 1 – Purchase one of our server products. STEP 2 – Make an appointment for your personal installation and setup service using the link in your purchase receipt. Have your Cleverbridge order number handy when scheduling your appointment. You will receive a confirmation email. STEP 3 – Download TeamViewer in preparation for your remote desktop trial installation call. This link will also be provided in an appointment reminder email, to be sent 30 minutes prior to your call. STEP 4 – One of our in-house technical support engineers will call you at your scheduled appointment time at the contact number you provided. All of our server products now include setup assistance for trials. STEP 1 – Request a Trial Demo Installation. STEP 2 – Schedule your demo installation appointment and receive a confirmation email. One of our in-house, technical support engineers will use TeamViewer remote desktop to install your NovaBACKUP software for you and do your backup configuration for you while you watch and learn. You will receive a product walk-through, get your backups scheduled and have the opportunity to ask any questions you may have. Schedule Your Trial Demo Installation Appointment Today! Got Questions about Setup Assistance or Demo Installations? Feel free to ask us any questions you may have about these no-cost professional services for server-level customers and trial users.